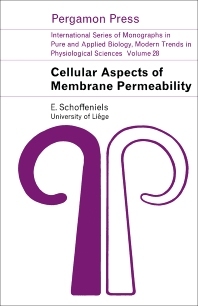 Cellular Aspects of Membrane Permeability describes the state of knowledge on permeability problems and interprets experimental results within the framework of working hypotheses. The book discusses membrane permeability with some biochemical perspective presented to explain the origin and adaptations of animal life. The text explains the process and the driving forces affecting the permeability characteristics of the experimental object. It then discusses the distribution of ions and molecules between two phases separated by a living membrane. Then the text analyzes the chemical nature of the molecular architecture that causes such permeability characteristics. The book addresses the electrical potential profiles of epithelial tissues, and then discusses the conducting membranes. It also explains the relationships between inorganic ions, sugar, amino acids, fatty acids, and bioelectric potentials. The book also explains the physical nature of such chemical nature and structure of living membranes. The text then describes the structure of the cellular surface and the structural organization of the cell. The selection can prove useful for biologists, microbiologists, zoologists, and students and professors of biology and its related disciplines.